Root 66® Uses Sectional Cable for 1-1/4" - 4"
The Root 66 is a real advance in sectional cable machine design. No mid-range machine has its versatility and power. Look at its versatility. 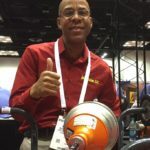 You can drive 5/8″ cables for lines up to 3″ and 7/8″ cables for 4″ lines – and you can switch from one to the other in seconds, without touching the jaws, without an adapter, without tools. And for sink drain work, slip on a drum that holds smaller cables. To operate, just feed a cable into the line and slide the back end into the machine. The excess cable goes into a guide tube. Turn on the sealed motor, press down on the handle, and the Root 66 starts spinning the cable at 400 rpm. The cable stops rotating as soon as you lift the handle, so there’s no additional torque buildup. 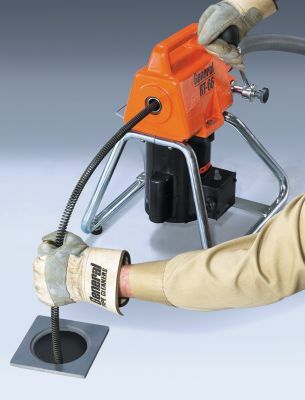 When using a drum for small drain work, the drum stops turning when you lift t he handle to the neutral position. It’s three machines in one. Clears 1-1/4″ through 4″ drain lines. Drives both 5/8″ and 7/8″ sectional cables. Change cables instantly–no tools or adapters required. Small drum holds 25 ft. of 5/16″ Flexicore cable to clear 1-1/4” to 2” lines. The Root 66 has a wide four point base for greater stability. Its interlocking tubular construction also gives it excellent durability. To protect the gears from dirt and for easier cleaning, the machine has two internal plastic shields. A ground fault circuit interrupter is standard equipment. Jaws handle both 7/8″ cables or 5/8″ cables. No adaptor required. 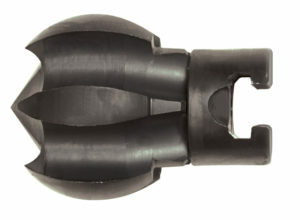 Standard cable sections for the I-95 and Root 66 are open-wound hollow cables with R-Connectors (Compatible with Ridgid®). They are available in 5/8” x 7-1/2 ft. sections (Cat # 7.5R8) to clear 2” and 3” lines up to 125 ft. long, or 7/8” x 15 ft. sections (Cat # 15R10) to clear 3” and 4” lines up to 150 ft. long. They snap together in a second and are taken apart quickly with a coupling key. Optional Proflex sectional cables (Cat # 15R10-P, shown below) sport an inner spring. It gives the cable greater strength to resist kinking and to transfer extra torque down the cable for additional cutting power. Smaller 5/16” Flexicore®cables (Cat # 25HE1-A) can be used with an optional drum to clear clogged sink lines and other small 1-1/4” to 2” drain lines. Rip through tough stoppages with the unique ClogChopper multi-function cutting tools (Cat # R-2-1/2CG, shown below). 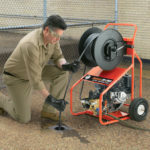 Six self-sharpening blades dig into encrusted debris and root masses, easily grinding up stoppages, scale, and crystallized urine, without risking pipe damage. 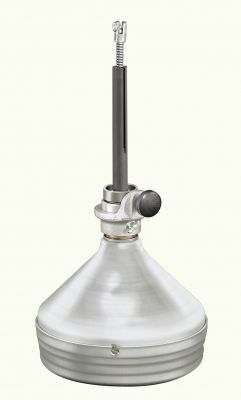 The spherical design maneuvers around tight bends and traps, thoroughly and safely cleaning metal, plastic, and clay pipes. As it spins, it also self-sharpens as it scrapes along the pipe walls. 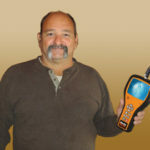 It’s excellent for clearing stacks, downspouts, mains, as well as for drain lining jobs. A dolly that clamps onto the Root 66 in seconds. 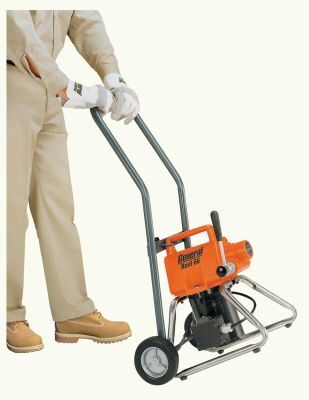 For small drain work, get the optional drum. 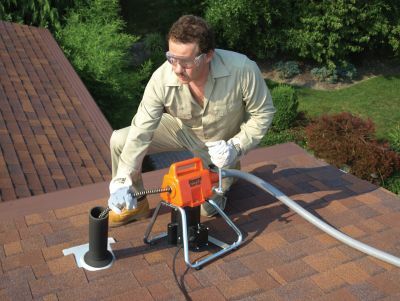 It slides easily onto the back of the machine to clear 1-1/4″ to 2″ drain lines. It holds 1/4″ or 5/16″ Flexicore® cables up to 50 ft. long, or 3/8″ Flexicore® cables up to 35 ft. long. 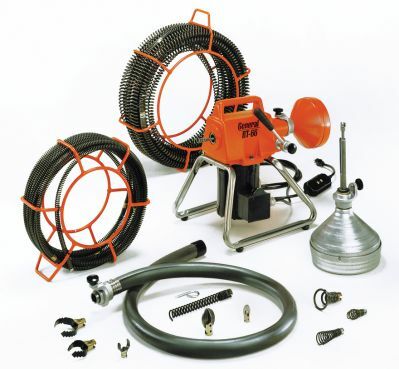 Root 66, plus six 7-1/2 ft. x 5/8″ sections (7.5R8), an SCC small cable carrier, and an R-8CS cutter set. 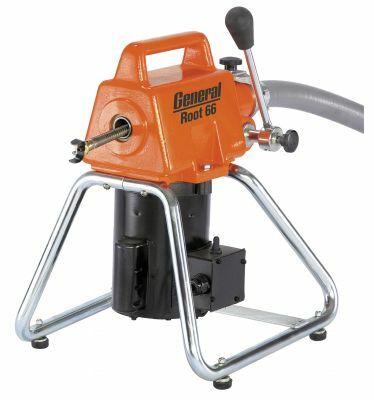 Root 66, plus five 15 ft. x 7/8″ sections (15R10), a CC cable carrier, R-10CS cutter set and a tool box. Combines Units A and C.
Same as RT-66-D, plus small drum (66-25A) with 25 ft. x 5/16″ cable (25HE1-A) installed. (Optional) Holds 25 ft. of 5/16” cable for 1-1/2” to 2” lines, or 35 ft. x 3/8” cable for 2” to 3” lines. Two shields to protect bearings and motor from dirt and moisture. Pull down two position handle to spin cables at 400 RPM. Lift to stop. Brake stops spinning drums instantly. 7 1/2 ft. x 5/8″ (Cat #7.5R8) for 1-1/4 to 3″ lines up to 100 ft.
15 ft. x 7/8″ (Cat # 15R10) for 2 to 4″ lines up to 125 ft.
“T” slot couplings slide together to lock and uncouple. Spear Head, 2″ U-Cutter, 3″ U-Cutter, Hook Auger and Retrieving Tool. Arrow Head, Boring Gimlet, 1-1/2” U-Cutter and Retrieving Tool. Drive both 5/8″ and 7/8″ cables without adjustment; also grip containers for smaller diameter cables. Keyed for longer life and less slippage. Double palm, for hand protection when guiding cable.